They want to know how I’m doing two podcasts a week and writing an average of 4,000 words of shownotes for each. All of this is on top of a weekly newsletter, blog posts, engaging in your Community, posting to social media, commenting on Google+, Facebook, Twitter, Instagram—it seems impossible! How are you doing all of this? 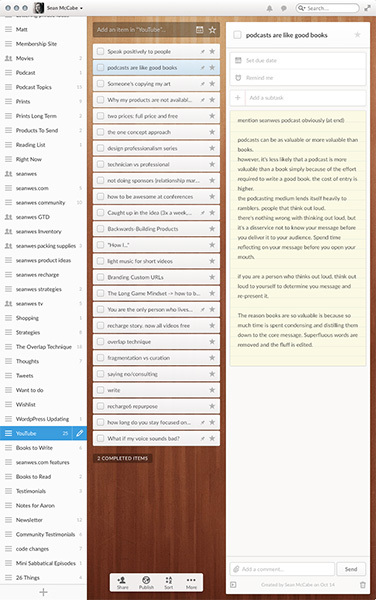 Okay, it’s not really my brain, I have an app called Wunderlist. But I have a lot of lists! I’ve got lists of lists with items in them and notes for each of those items. You need something like this is because our brains shouldn’t be used as storage devices. We spent so much time growing up memorizing facts and memorizing numbers but now we have Google and Wikipedia. We have devices in our pockets that can access all of that information in seconds. I use my brain as processing power not as a storage device. I don’t think our brains should be used as storage devices. We can store all of that information in software and it’s easy to see right at a glance. We don’t have to remember. We don’t have to use some of that mental capacity to hold onto things. We can use it to process things, to think about things, to plan things, and to act on things. Get it all out of your head. Put all of those concepts, ideas, and topics on paper. Put them onto a computer. You don’t want to lose those. You don’t want to spend part of your mental capacity holding on to those ideas, you want to spend that mental capacity thinking about those ideas. In order to think on them, you need to remember them. In order to remember them, you need to save them—you need to archive them. You want this list because when you carve out time to do your work, you don’t want to be scrambling to find the topic to write about, or find the topic to podcast about, or shoot a video about. That time when you sit in front of your desk with no distractions and a blank page in front of you is not the time to start thinking about what your topic is. You want to be building a collection throughout your day and throughout your week, so that when you sit down to work, you can just pick a topic and go. The most common question I get is, “Okay, I have a list of topics and I’m sitting down and ready to work, but which one do I choose?” You’ve just got to pick one and go with it! Now, I know that’s hard because you’re experiencing paralysis here. You’ve got a bunch of options and it’s stifling your creativity. You’re now spending valuable energy fretting over picking the topic. This brings me to what I call the Freedom and Creativity Paradox. What we need to do here is eliminate the paralysis of choice. To illustrate, I want to give you two different scenarios to compare. That’s kind of difficult. It’s difficult because there’s a wide amount of possibilities. You’ve got a blank sheet of paper and any instrument you can imagine to choose from. You get a sheet of paper. You get a red crayon. You get a blue crayon. You get a fine-tipped, black marker. Your scene is an imminent car crash. You have a 4-inch diameter circle to work with for your composition. You have 5 minutes. Go. Now your mind is spinning! It’s racing. It’s trying to figure this out: “Okay, I have these tools to work with, this circular composition, this scene, in this amount of time.” You have to figure something out and it’s actually sparking that creativity. The constraints and the restrictions are what enable you to be creative. You have a box within which to think—or within which to think outside of. You can’t think outside the box without a box. So choice is the arch enemy of creativity. You would think that the more freedom you have, the more creative you would be. It’s counterintuitive because the opposite is actually true: creativity feeds on constraints. If you have a wide-open plain of possibilities and choices, it’s too much pressure! You’ve accumulated a list of topics. You’ve designated a spot on your schedule for writing. But if you’re still experiencing paralysis on what topic to go with, you need to schedule the topic itself. You’re collecting ideas throughout your day and throughout your week—gathering these topics and concepts to write about, or podcast about, or shoot a video, but when you go to schedule that time and put a spot on your calendar, write down exactly what you’re going to talk about. Don’t give yourself any options. The second way of narrowing down and reducing choice to boost your creativity is actually the one that I do: it simply what I call The “Back Against the Wall” Trick. Of course, it’s not really a trick at all. You saw the big huge list of things I have that I call my “brain.” It’s a list of topics ideas and notes so that at any time, I can grab one of those and just run with it. For this show right here, I didn’t have the topic until 15 minutes before we started. I had to pick one. I look at that big list and I have to pick one and I have to go with it. It’s do or die—my back is against the wall. I have no choice. Like I said, there’s no time to balk. Cory (my video guy) is here. I’m paying him a salary. It’s on the schedule. He’s going to show up. A video has to be shot. It’s the same thing with Ben—the co-host of my podcast: he’s going to come over, it’s on the schedule, and I’ve committed to that. I have something to live up to. I’ve put myself in a situation where there is no option of not having a show. It’s just rigid. What people do is they psych themselves out of creating. They psyche themselves out of doing something. Because they have the time to do so. They have the option to do so. You cannot afford to psych yourself out of doing something. Get your back against the wall. This is how I’m able to do it. It’s non-stop. I don’t give myself a second to think myself out of doing something. It’s on the calendar, it’s on the schedule, I’m going to do it because it’s there. I’m making a commitment to someone—maybe it’s a personal commitment, maybe it’s public commitment—but people are expecting something from me and I have to deliver. If you want to be prolific in your output, you have to put yourself in that kind of a situation so you don’t psych yourself out of creating.